Right now, hundreds of thousands of cosmic rocks are hurtling through our Solar System at 100,000kph, each one capable of ending life on our planet faster than you can say doomsday. Forget corny Hollywood blockbusters such as ‘Armageddon’ and ‘Deep Impact’, the real space race is to locate these earth-shattering asteroids before they send us all into the next ice age. Astronomers believe up to a million Near Earth Objects are tumbling through space at cosmic speeds, the vast majority of which we have no idea where they are. The scariest factor of all is our understanding of these supersonic speed rocks has only just begun. And that’s where the work of a group of Mid Wales-based astronomers steps in. The Spaceguard Centre in Knighton, Powys last month received a highly important piece of equipment that will soon keep an eagle eye on near space. Donated by the Institute of Astronomy at Cambridge University, the £500,000 Schmidt camera, which is now the most powerful telescope in Wales, has been transported to Powys to take advantage of its light pollution-free skies. Headed by Jay Tate, the Spaceguard Centre’s mission is to expand our knowledge of the vast number of Near Earth Objects spinning through space. The task is a massive undertaking. Last month, scientists at the University of Southampton predicted an asteroid “only” 50m across – a piffling size in cosmic terms – would cause mass loss of life if it hit Earth. But despite this shocking prediction, there isn’t a single international body responsible for tracking the whereabouts of interplanetary objects. At the turn of the new millennium, around 26,000 asteroids had been identified. The count has barely started, and that’s why the Schmidt camera is vital. Tate says the eventual aim of the work at the Spaceguard Centre, which was founded in 1997, is to build a global movement responsible for recording comets and asteroids. “The technology works,” Tate says. “But there are underlying political issues why the work is so badly funded.” At present, only the Americans are currently bankrolling efforts to identify NEOs; a situation that Tate says is causing increasing resentment within NASA and the US Air Force. “US Congress has a hard job justifying budgets, the Americans need to see their work is being shouldered by other nations. They’re getting a bit annoyed at being the only ones doing it,” Tate says. “There are only a handful of people in the world doing this work. 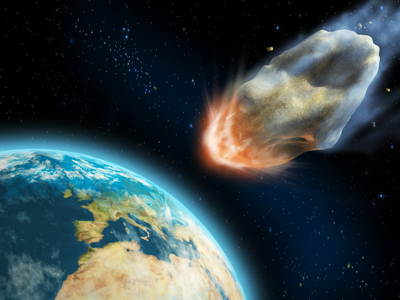 Humans are only just beginning to understand how devastating an asteroid strike would be. We got our best idea yet in July 1994 when Shoemaker Levy 9 smashed into Jupiter – a planet over 300 times bigger than our own. The apocalyptical results were watched through the Hubble Space Telescope. Shoemaker Levy 9 was a clump of around 20 asteroids that slammed into Jupiter at 60km a second. The force of one individual fragment had the equivalent strength of six million megatons – six times the strength of the atomic bomb dropped on Hiroshima in 1945. What would happen if a similar sized chunk of rock hit our planet is unknown, but the prognosis is bleak. An asteroid travelling at cosmic velocities into our atmosphere would take just four seconds to hit the ground. The science and travel writer Bill Bryson surmises the compressed air temperature below an asteroid would soar to a mind-blowing 60,000 Kelvin – 10 times hotter than the surface of the sun. Staggering quantities of debris and searing gases would erupt into our atmosphere and rain down as molten rock across the entire planet. Every living thing within a 500km radius of the impact site would be wiped out, meanwhile monstrous tidal waves would engulf the planet as simultaneous earthquakes and volcanic eruptions occurred. Low-lying communities would be sunk and the Earth’s atmosphere would be smothered in a blanket of dust and ash that would blot out the sun for years, destroying the world’s food harvest. Millions would die within the first 48 hours. It would be an event of Biblical proportions. Highly improbable, perhaps, but not impossible. Some scientists believe it was an Earth-bound asteroid 65 million years ago, at the end of the Cretaceous Period, that killed off the dinosaurs. “There isn’t a single global body out there responsible for [tracking asteroids],” Tate explains. “Maybe there’s an assumption that nothing can be done but plenty can be done. We have the technology available; it’s a question of resources. “Quietly and efficiently we can locate these objects and identify the risk until the day comes when we know how many of them endanger our planet,” he says. “It’s not the case that we can’t do it, rather we can’t be bothered to. I hope we realise this, if we’re not all living in caves by then,” he adds cheerily. Of course, identifying asteroids is one thing, stopping them is a different matter. Short of sending Ben Affleck into space so he can blow the object to smithereens like he did in ‘Armageddon’, there aren’t many sensible suggestions how existence could be saved from millions of tonnes of Earth-bound cosmic rubble. But the work of people like Jay Tate brings hope that one day we might. Article first published in The Big Issue in July 2009.